Added Japanese and Dutch language packs. 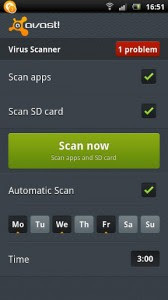 Scan of the SD card(s) now starts immediately. Added an option to keep the CPU running while scanning significantly increasing the speed of the automatic scan. Enhanced usability of the password dialog. Protect personal data with automatic virus scans and infected-URL alerts. Stop hackers by adding a firewall (rooted phones). Control anti-theft features with remote SMS commands for: history wipe, phone lock, siren activation, GPS tracking, audio monitoring, and many other useful tools. Your ‘invisible’ app hides itself, making it extremely hard for thieves to find and disable. A standalone yet tightly integrated component of avast! Mobile Security, avast! Anti-Theft is the slyest component on the market. 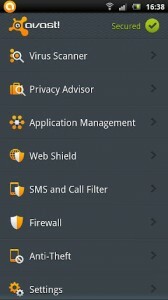 Formerly known as Theft Aware, the Anti-Theft portion of avast! Mobile Security has been recommended by leading industry experts that include T-Mobile, N-TV, AndroidPIT, and Android Police.